While Kanturk Country Retreat sleeps 19 people, the base price to book the three cottages assumes there are 12 people booked in - two in The Pool House, two in The Sixth Hole and 8 in Kookaburra Cottage. Additional guests are charge $95 per person. Bookings to just one cottage are charged accordingly. Due respect must be shown to the guests in the other cottages. There is no bombing, running or boisterous behaviour allowed at the pool and no glassware or bottles allowed poolside. Plastic 'glassware' is provided. Please hang towels on the clothesline and don't leave them on the pool chairs. Also if you have a bbq in the pool pavilion, clean up after use and leave it as you found it returning food etc to your cottage fridge. The pool pavilion fridge is for use during a bbq only. Clean the bbq for the use of other guests. If behaviour causes a disturbance to the amenity of the area, such as a complaint from a neighbour or the police, $300 will be deducted from your bond. We try to minimise our impact on the environment as much as possible, and sort rubbish so it can be effectively disposed of as easily as possibly, also our local tip accepts recyclables only. To facilitate this we provide a recycle bin (with a yellow lid) for bottles, cans and cardboard and a green rubbish bin for general rubbish. If you have rubbish in excess of this, please put them into appropriate garbage bags beside the appropriate bin. You will be charged a rubbish disposal fee of $120. If the rubbish has to be sorted, you will be charged a fee of $50 per bag. Please also understand that the bond is $600 ($200 per cottage). The Pool House is a romantic, luxury, alpine-style two-storey single bedroom retreat for two people by the pool and overlooking the dam. This cottage has an Italian marble bathroom, smeg appliances, wood fireplace, spa bath, sweeping views from the upstairs bedroom and french doors that open to a balcony overlooking the dam. The cost for this cottage is $345 for a couple. Along with the wood fireplace and a ceiling fan, this cottage also has reverse cycle heating and cooling. The pricing is for self contained accommodation with all linen and towels, tea and coffee provisions, home made cookies or cake and my hand made soap and fresh flowers provided. The Sixth Hole is a one bedroom, rustic log cabin with a large open plan kitchen/living area featuring a large stone fireplace. The bedroom features a queen-sized bed and a sofa in the lounge doubles as a second double bed. This cottage also has reverse cycle heating and cooling. This cottage is a great space for larger groups to hang out in. Kookaburra Cottage is a four bedroom contemporary-style cottage with an open-plan kitchen-living area, with full kitchen facilities including dishwasher, coffee plunger and orange press, TV, DVD and CD/radio provided. The bathroom facilities include two showers and toilets and a laundry. It has a king-sized bed in one bedroom, a queen-sized bed in the second, a built-in bunk in another (two beds) and the fourth bedroom is a dormitory with five single beds (and a trundle bed if needed). All linen and bath towels are provided for your secluded retreat.This cottage also has reverse cycle heating and cooling. It is set in country gardens on a property of three hectares with native bush walks, bbq facilities, tennis court, swimming pool and country-style golf course. Ideal for book clubs where you can sit around the fire in the log cabin with a glass of wine and solve the world's problems. Or just enjoy the bird watching. The property is ideal for club getaways, family gatherings, birthday celebrations - the possibilities are endless. We live on the property. The area inside the circle of the driveway is private property. There are three cottages on the property. Due respect must be shown to the guests in the other cottages. Our little poodle dogs Hendrix and Lulu will join the welcoming party on arrival. Please let us know if you don't like dogs and we will keep them inside. The golf course, tennis court and swimming pool are shared facilities for the use of all guests. No loud music can be played on the property unless prior arrangements have been made with management. There is no bombing, running or boisterous behaviour allowed at the pool and no glassware or bottles allowed poolside. Plastic 'glassware' is provided. Please hang towels on the clothesline and don't leave them on the pool chairs. If you have a bbq in the pool pavilion, please clean up after use and leave it as you found it returning food etc to your cottage fridge. The pool pavilion fridge is for use during a bbq only. Clean the bbq for the use of other guests. Also, while we don't like to keep any bond, if excess rubbish or mess is left, we will charge a fee for reinstatement and rubbish disposal. The house inside the driveway circle is our home and is private property, but enjoy the rest of the property. Let us know what you are particularly interested in so we can ensure it is ready for use when you arrive. Sally's mobile is available if you have any questions. Enjoy the natural setting (wallabys and koalas used to live in this area but now are rarely seen) abundant birdlife occasionally sugar gliders in the of Langwarrin South, just 45 minutes from Melbourne CBD, five minutes to shopping centres of Somerville, Langwarrin and Pearcedale and 15 minutes to the seaside thriving metropolis of Frankston, Hastings and Tooradin, if fishing is more your thing. If hitting the surf beaches is more your scene, wake up refreshed then head down the coast to Point Leo (30 minutes away) or down the Peninsula Link freeway to Gunnamatta, Portsea, Sorrento (50 minutes away) or stop at any of the many beaches along the way. Buses run every few hours from Frankston to Pearcedale (the 776 bus) which stops at both ends of West Road. However we will usually try and pick you up from Frankston station if we can. This is by prior arrangement obviously. Taxis also operate from Frankston. The Sixth Hole price per night is $210 per night. This is for self contained accommodation for two adults with all linen and towels, tea and coffee provisions, home made biscuits or cake, and my hand made soap and fresh flowers provided. Additional people are charged at $85 per adult and $45 per child under 12. 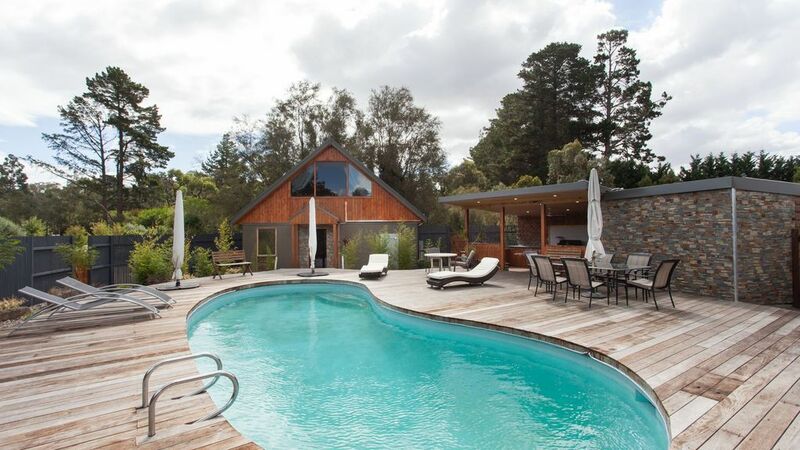 Kookaburra Cottage is a large four-bedroom cottage. The minimum rate for four people is $380 per night. Additional guests are charged at $85 per person for adults and $45 per child. Pricing is for self contained accommodation with all linen and towels, tea and coffee provisions, home made biscuits and my hand made soap and flowers provided. We are former journalists who have retired early due to the changes in the industry in recent years. Sally now makes handmade soap and natural body products which she sells through her business Bird Body Essentials, and Gary keeps the garden and property in shape. It keeps us on our toes. Why not? You get to relax in a private haven away from the hustle and bustle with family and friends, or enjoy a romantic escape. Enjoy the private three-hole golf course where it doesn't matter how talented you are at golf, bush walks, tennis court and even watch some sugar gliders go about their nocturnal forage for food. You can even enjoy some croquet.